L’inter AFOCG, association nationale, est constituée des 23 associations intervenant dans une trentaine de départements. Elle représente environ 2300 exploitations, 3000 agriculteurs et 70 animateurs-formateurs en 2018. 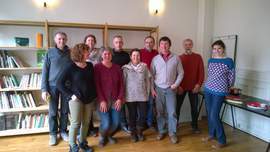 InterAfocg is a French national network of organizations (Afocg) making lifelong vocational trainings in economics (accounting, management, strategy…) for farmers and rural inhabitants. Educational methods focused on experiences (coming from the trainees), time (the approach promotes trainings lasting in the time in order to interact better with the experience) and collective (the trainees learn from each other). Afocg organizations aim to improve people’s abilities to understand and to master better the complexity and the totality of their farms, according to their values and their goals. Afocg encourage each person to become more autonomous, responsible and united in the agricultural and rural development. The national organization InterAfocg realizes different activities for its local members: animation of the network, investigation on several topics (settlement and transmission, small farms management, work organization and time management on farms, women in agriculture, collective farming...), training of the trainers, promotion and representation to other organizations and public institutions. Son Conseil d’Administration est composé de 11 agriculteurs et agricultrices adhérents aux AFOCG. Ils sont élus pour un mandat de 3 ans lors de l’Assemblée Générale annuelle.